Soulful, good rockin' blues and R&B. 1. What's a Man to Do? dish out a bit of swing, killer funk and loads of deep fried soul. The musical question 'What's a Man To Do? '(Sugar Beat 2001) kicks off a set defined by the bandleader's keyboards and saxophone and Mike Fishell's versatile guitar. White's intense voice matches his R&B-drenched songs, with their hints of Louis Jordan, Tyrone Davis, Little Feat, Jackie Wilson, Dr. John, Creedence and more bubbling below the surface. The minor-key Latin groove "Take These Blues" stands out from a stellar set"
Out of Oxnard, California came Steve White and the Barstool Pigeons. As Joe said in the program: "Funny name, fabulous band." I had to agree! Sharon and I both liked Steve's vocals. He has what I call a "blues voice." It grabs you and won't let go even if you got down on your knees and begged. As I listened I thought how great it would be to get Steve White and Nick Riviera of Big Nick and the Gila Monsters together for a duet. What a storm that would be! Mike Fishell, lead guitar, glided over the frets, producing intense sounds as Kelvin Ammons beat a contagious rhythm out of those drums. With Bernie Travers' bass thumping, this band was one fantastic ride. 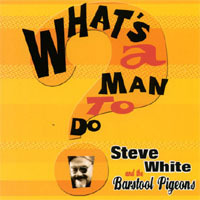 Steve White & The Barstool Pigeons "What's a Man To Do?". Sugar Beat. Un autentico musico en el sentido mas amplio de la palabra. Steve White toca piano, organo, armonica, saxo, canta y, por supuesto, escribe sus propiascanciones y, ademas, admirablemente. En este disco variado pero al mismo tiempo, homogeneo y tremendamente bien concebido, brillan a gran altura los musicos que le respaldan que son bateria, bajo y guitarra. Swinga con ellos y pasalo bien. MUY BUENO. A real musician in the widest sense of the word. Steve White plays piano, keyboards, harmonica , saxophone and, of course, he sings wonderfully. Altough the cd sound is quite varied, on the whole it is homogeneus and well conceived, A special mention must be done to the backing drummer, bass and guitar. Swing with them and enjoy their music. GREAT. Eine wirklich gute, traditionelle Bluesband aus Oxnard, Kalifornien, aus der Steve White besonders hervorsticht. Er ist nicht nur ein Multiinstrumentalist - Tasteninstrumente, Saxophon, Flöte, Harmonika und teilweise auch Gitarre- sondern auch noch ein ausgezeichneter Sänger und Songwriter. Auch Mike Fishell, der Gitarrist, Co-writer und Sänger ist eine herausragende Figur und die Rhythmusgruppe überzeugt ebenfalls. Man merkt der Band ihre Professionalität an, die sie sich in vielen Live-Auftritten mit verschiedensten Blues-Größen erarbeitet hat, obwohl die CD in dieser Besetzung ein Debüt darstellt. Blues with a feeling, insbesondere zu hören auf âWhat's A Man To Do?" oder auch auf âTake These Blues". Von dieser Band sollten wir mehr hören. A really good traditional Blues band from Oxnard, CA which prominently features Steve White. He's not only a multi-instrumentalist - keys, saxophone, flute, harmonica and some guitar parts, but also an excellent singer and songwriter. Mike Fishell, the guitarist, co-writer and singer, also stands out, and the rhythm section's work is convincing. The band has played with a number of Blues greats live, and it shows in their professionalism, even though the record, with this line-up, is a debut. Blues with a feeling, detectable notably on "What's A Man To Do?" or "Take These Blues". We should be hearing more from this band. Upon listening to the songs on this CD, I had a difficult time choosing a song for "Nobby's Indie Picks of the WeeK" at the MARSH's "Musician's Hang". Not only wasn't there a clunker on the album, there was something outstanding about every cut of this classic R&B and Blues album. So... what's a man to do? I wound up picking the title track. But just like a man, I drive an El Dorito and I sure look good in blue (jammies that is). I highly....I mean soberly recommend purchasing this cd to play at frat parties, in the privacy of your own pigeon coop and my favorite...SLEEP OVERS! Great blues kids...gotta fly!